Whadaya want me to do everything ! but he's kinda cute - in a weird way. While our economy still seems to be in the dumper, there are some rays of sunshine. 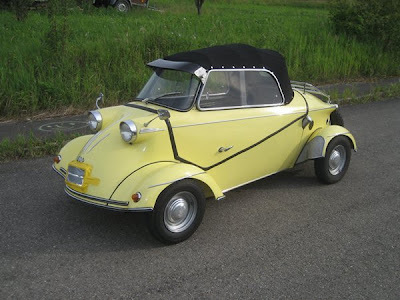 Last week I stumbled on the ebay (UK) auction of a 1961 Messerschmitt Tiger Tg-500. The car looked to be in great shape, but the thing that really caught my eye was that the bidding was at $125,000, and the reserve hadn't been met. 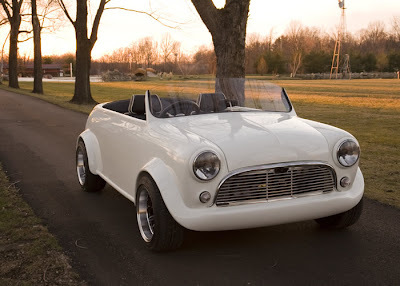 My first thoughts were that someone had posted the car to test the water, with a "crazy-high" starting bid, but when I went into the bidding history it showed that the bidding began at $200, and that 29 bids had been involved in getting the price up to $125,000. I made a note to myself and went back to the auction when it was ending. In true ebay fashion, the bidding jumped up in the last seconds, closing at $159,100 -- but still not reaching the seller's reserve price. I can't speak for what was in the mind of the seller (or the hopeful bidders), but I think I would have jumped at a price of almost $160,000. 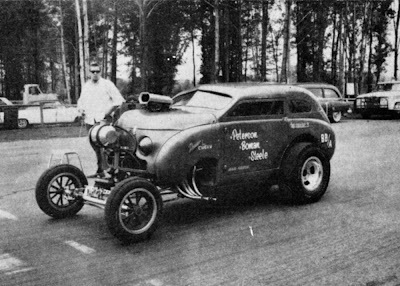 The Hemmings Blog uncovered this photo of a Crosley-based, meth-fueled dragster from 1966. 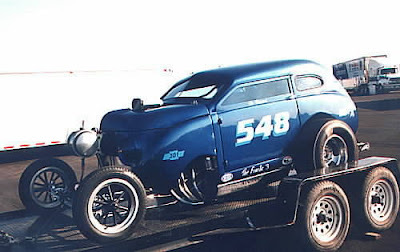 According to the posting, the "Blue Goose" was a BB/A entry at Milan Dragway in southern Michigan. The car was raced by Peterson, Bowman and Steele of Ann Arbor, Michigan. They are still running 1/4 miles at Milan, but it is pretty unlikely that you'll see anything like the Blue Goose there today. 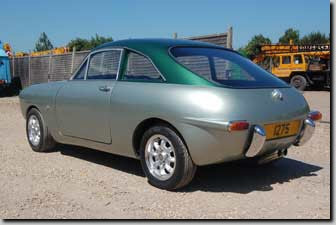 Nostalgia Motors in the UK has brought out the Ogle SX 1275 GT Mini. every detail of the original. except adding some modern upgrades. This new edition even has an endorsement from the Ogle family. The serial numbers will continue where they left off way back when. made in 1934 (and nominated for an Academy Award) is our movie of the day. where the idea for the King Midget came from. While the popular press may have coined the term, soccer moms have been with us for years. The combination of kids and sports leads to the need for a car with a bunch of seats -- although back in the good old days you could get away with carrying more passengers than you had seats by stacking them up (like cord wood) in the back of a station wagon, or telling them to hang on while they rode in the bed of a pickup truck. These two Fiat Soccer Moms have got it right. 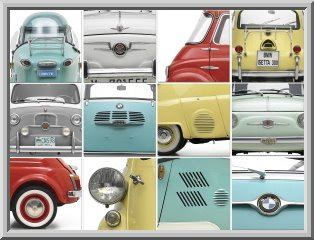 Which one is your favorite -- "Topolino Mom" or "Multipla Mom". Every now and then you see something and you ask yourself..."How did they manage to do that?" And in today's movies, the answer usually has to do with some kind of special effect. The actors really have to be able to act, because they are reacting to things that aren't happening, and won't exist until the magic of post-production inserts the monster, or the transforming car, or the exploding building. Well...the 1986 New Zealand movie, "Malcolm", was made back in the days when -- "If you want to have a car split in half and continue driving, you've got to figure out how to make that happen." 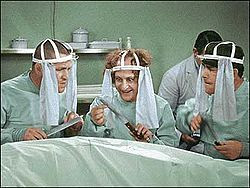 Yesterday's blog entry gave you a taste of what was happening in the movie. Today you get some more. MALCOLM the movie was an Australian comedy. 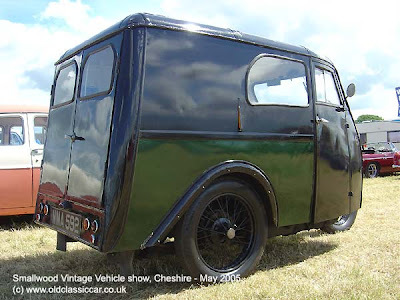 We usually don't associate a 4cv with a checkered flag, so we have to think again. 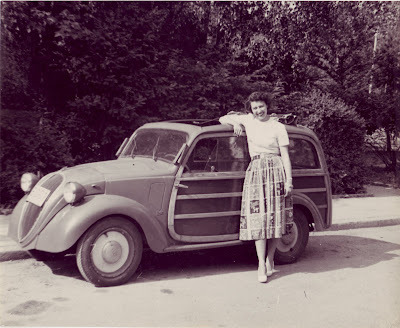 Yesterday we had an ad for overseas delivery of a Renault 4cv. 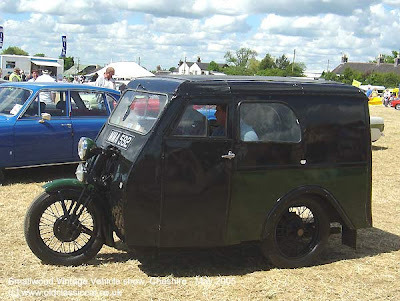 Today we have the various looks of this French minicar. We've all heard about those "drive and buy" programs for Mercedes or for BMWs -- but you may not remember that Renault used to have their own version of the Euro Delivery option. Pick up your Renault in Paris and you can save $300 off the price in New York. 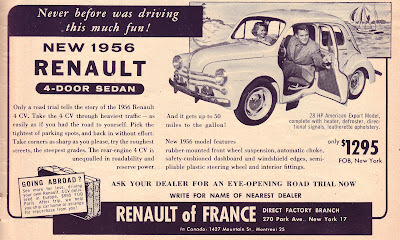 That may not sound like much, but in 1956, when the New York price of a Renault 4CV was just $1,295 -- that $300 could go a long to to subsidizing the cost of a European vacation. The Insurance Institute for Highway Safety (IIHS) recently tested seven mini- and micro-cars for low-speed crash repairs and rated only one acceptable and one marginal. 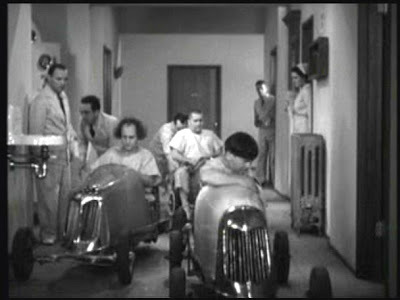 The other five cars were rated as poor. The cars in question (from first to last in rankings) are: Smart ForTwo, Chevrolet Aveo, Mini Cooper, Toyota Yaris, Honda Fit, Hyundai Accent, and Kia Rio. The test involved four "parking-lot speed" crunches (front, front-corner, rear, and rear-corner). The total cost of repairing the cars after the four "events" was used to rate the cars. The Smart ForTwo performed the best with a total repair bill of around $3300 with an average repair cost of $899. 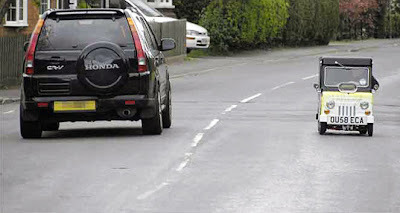 The big watch-out seemed to be the Kia Rio. 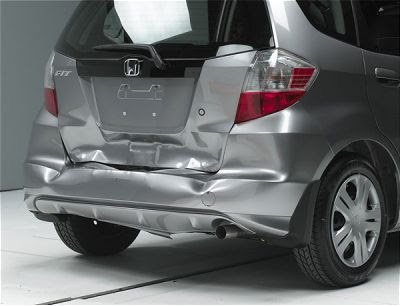 This $12,000 car ended up with a repair bill of $9,400 after being banged around by the IIHS. The IIHS tested another 54 cars, using the same parameters. Thirty-eight of them were rated as poor. 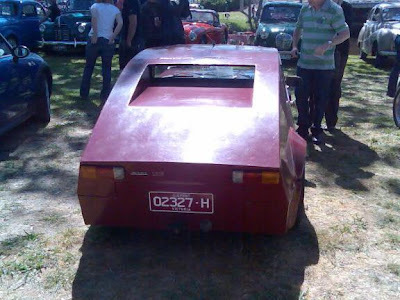 Small homebuilt car from Austrailia made from Morris and Mini parts. The body is made from plywood and fiberglass. It stands to reason that if advertising works in the West -- it would probably work in the East as well. Take a look at this example of Madison Avenue Advertising . 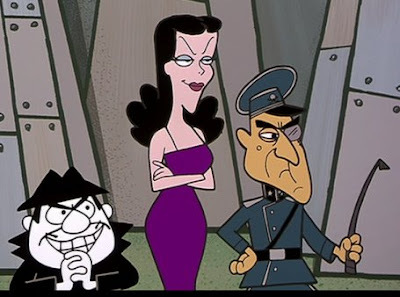 . . East German Style. 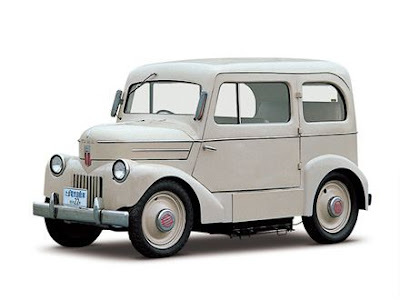 The Microcar Club of Mexico is our club of the month. If either of these names suit you -- then you need to find the right ride to carry it off. 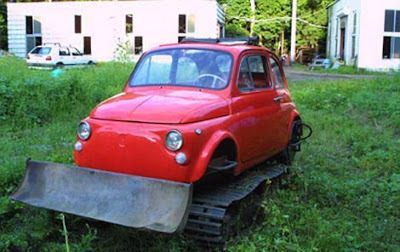 And this is the car to use when you are out to catch "Moose and Squirrel". 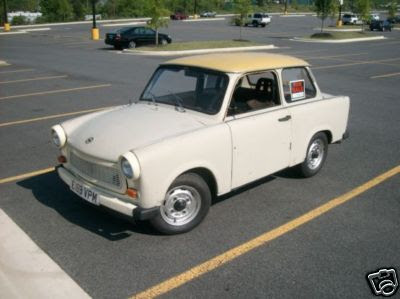 How about a 1973 Trabant P601S? And I'll bet that "cotton fiber"-based fiberglass body is really an early attempt at stealth technology. Check it out on ebay. 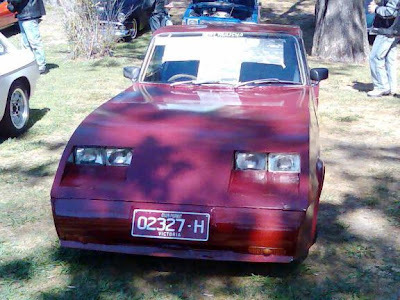 It's not often you find an East German car for sale in the West. Yes...it's been a long time since this many Trabants have been together. The Red Dwarf series seems to be an strange marrying of "Battlestar Galactica" and "Spaceballs". Just the show we have all come to expect from the English. But the cool part is the spaceships. Unlike Star Trek, with a small set of standard ships (Federations Starships, Klingon Cruisers, Romulan Warships), every episode of Red Dwarf seems to come with a whole new set of elaborate spaceships. 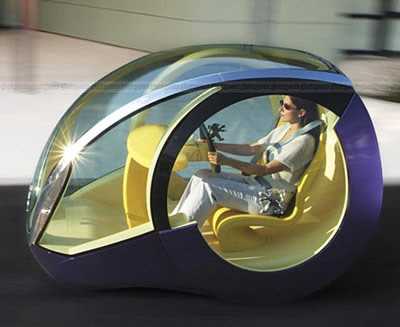 And in the "Back to Earth" segment, we get their idea of a car from the future. 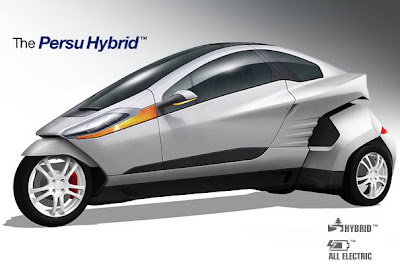 What is is -- a heavily-modified Smart Car. car of tomorrow - We're still trying to get a reasonable electric on the road. This video from Gullwing Photographic shows the diversity of makes, models, years and sizes of racecars that participate in vintage racing. 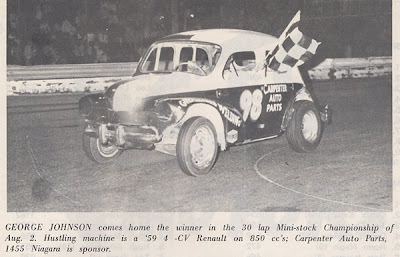 Everything from open-wheel racecars to a Volvo sedan -- even a fair number of racing specials. For those of us into smaller cars, you don't want to miss the little red OSCA (the first car in the video with a driver and a passenger), the silver open-wheeled Formula 500 racecar and the little blue DB Panhard. 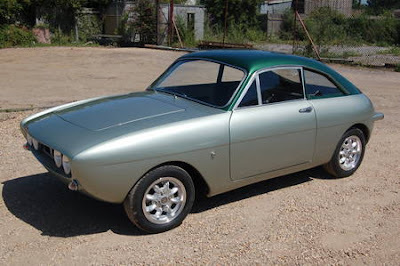 There is also a Crosley-powered, Devin-bodied racer -- the Ver Valen Special (It can be seen running behind the OSCA). If you want to see more, go to the VSCCA website. A Great Idea...Or a Bunch of Hot Air? Actually it would be compressed air -- running a car that emits an exhaust of cold air. Sound fantastic? Or maybe a little too fantastic? 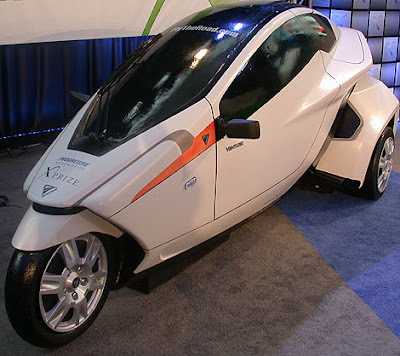 According to Zero Pollution Motors, they will begin taking orders for a $17,800 Air Car in mid-2009, with deliveries expected in 2010. The Air Car is expected to have a top speed of 96 mph, getting 106 miles per gallon (of compressed air). 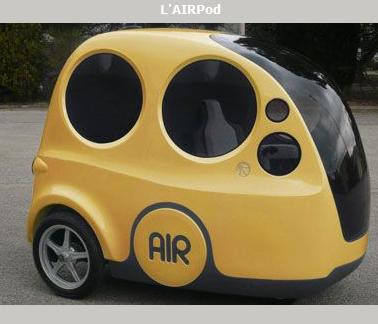 While Zero Pollution Motor's first model is expected to be the 13.4 foot long, six-seat Air Car -- we decided to post an image of their concept car, the AIRPod Urban Transporter. It looks to be a cross between a Smart Car and a GM/Segway. Pretty cool! 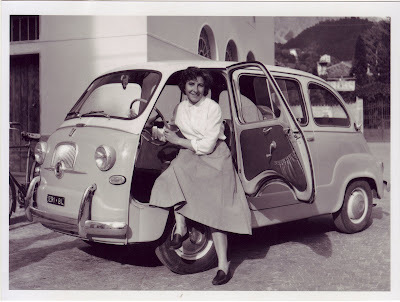 We couldn't resist reposting this -- because the illustrations of the microcars are so cool. This was posted on Ecofriend last summer, but we just saw the images this spring. “Every day the green blogosphere is flooded with news and concepts about eco-friendly cars that promise to make our world a better place to live in. Dunno how many of them are actually going to see the daylight before doomsday! 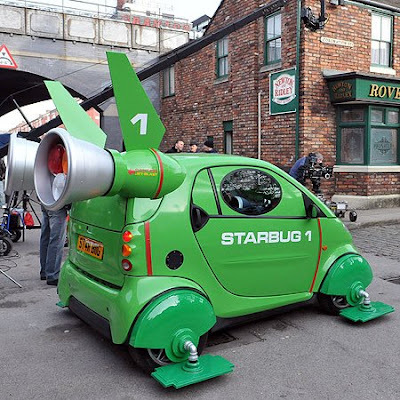 However that doesn’t stop us from bringing one more concept of a green mode of transport. 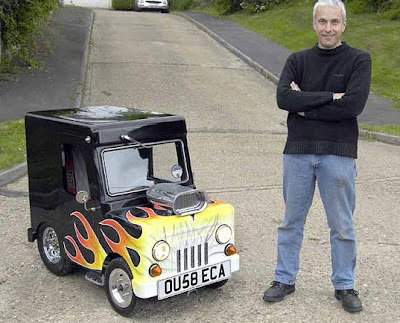 Supervised by Prof. Dr. Stephan Rammler, Mendel Heit has conceived a Microcar targeting both young and grownups. The design is highlighted by large round door slides away to the back. Electrically powered, it is intended to be crafted from lightweight materials like aluminum and plastic. The interior is the controls are extremely reduced to make driving more user-friendly. Featuring LED headlamps and tail lamps, it also comes with camera mirror and O-LED technology in the windshield.